I was super excited when I received a monster head of kale from an organic fruit and veggie shop, and the first thing I did was to whip up a batch of kale chips, and then immediately devour them! Even with that, I still had tons of kale left, and I definitely didn’t want it to go off. 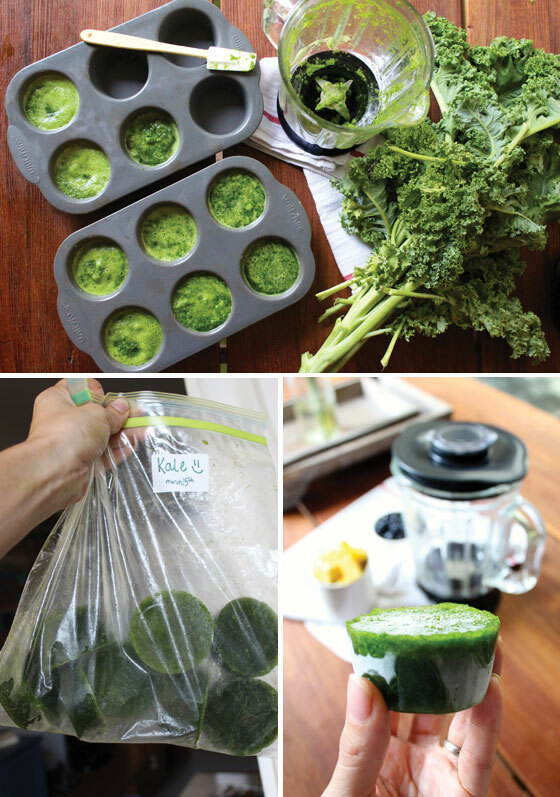 So here’s a quick tip for how to freeze your greens to prevent them from going bad. To top it off, I have an awesome green smoothie recipe for you at the end… yum! In a blender, blend up your greens. You can add water to help it along. Once it’s all blended up, pour it into a muffin tray and let it sit in the freezer until fully frozen. Once they’re frozen, pop them out of the muffin tray and store them in a container. Label it! This is so important – don’t skip this step. At some time, we have all found a mysterious block of frozen food in our freezer – food that was once lovingly prepared, but since forgotten. Mystery frozen blocks are never appetising. Label it, date it, and draw a little happy face on it, so that you remember just how excited you were about eating it! A muffin cup measures out to about 1/2 cup of veg each – so I can add this to a soup, pasta sauce or stew and it will just melt right in, getting extra greens in our diet! Here’s an another way to use your saved vegetables and one of my favorite recipes for yummy Green Smoothies. I love green smoothies because one drink packs in so much fruit and veg – it’s a great boost of nutrients and I definitely feel more energy when I drink one! I have found that the key to a yummy smoothie is having at least one ingredient frozen. It makes it creamier and smoother. I’ve added in a few extra super foods: coconut oil and chia seeds. I only add the chia seeds in after I’ve blended up the smoothie because I want the seeds whole. As they pass through your body they clean out your intestines helping to detoxify your system! They also help to regulate your blood sugar, so that you don’t have spikes and crashes throughout the day. * I pre-make a jar of chia seed gel by mixing 1 part chia seeds to 3 parts water. You can store it in the fridge and scoop it into drinks and smoothies.